As I promised I am looking for some great ideas for the up coming 4th of July Holiday. We like to grill on the 4th and have a BBQ. So I was looking for some recipes to share. I found some delicious looking and easy to prepare recipes from Maria Zoitas creator of Maria’s Homemade prepared foods sold exclusively at Westside Market NYC. 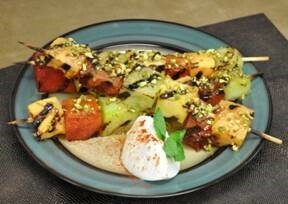 Maria’s recipes provide a flavorful, Mediterranean twist to the classic American barbecue staples. 1.Combine lemon juice, soy sauce, ginger, and black pepper in large resealable plastic bag. Add chicken. Seal bag, then toss several times to coat chicken. Marinate chicken in refrigerator for 20 minutes to 2 hours. 2.Preheat outdoor grill for medium-high heat, or heat grill pan on stove until hot. 3.Remove chicken from bag, discarding marinade. 4.Grill chicken 4 to 5 minutes per side. Serve with grilled or steamed vegetables. 1/3 Cup of unsalted pistachio shelled nuts, chopped roughly. 2.Pass through the wood skewers the cubed fruit in whichever order you want and place them. onto the hot grill to create grill lines for about 20 seconds each side. 3.Remove and place them in an oval platter, drizzle the kebabs with honey and sprinkle the chopped pistachios on top and around the grilled fruit kebabs. 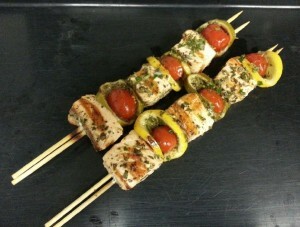 2.Skewer vegetables and salmon cubes and grill. These all look like they would be easy to make and look like they would taste good. 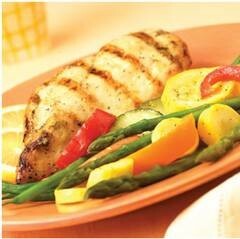 I think the Grilled Lemon Chicken is one of the recipes I will be using this coming weekend. I love chicken and steamed vegetables. What recipe do you think you would like? Have a good and safe 4th of July ! The photos and recipes were provide courtesy of Maria Zoitas.